Headaches can be caused from a variety of factors. But did you know that some headaches can be treated and prevented without medication? In this post I will identify the most common types of headaches and corresponding treatments for them. Check out my Facebook and Instagram Pages for more content like this! Causes & Triggers: Head pain that is referred from muscular, ligament, tendon, or nerves of the neck. Often begins with neck pain and progresses to one side of the head. Presentation: Pain in the neck that leads to headache symptoms on one side of the head. Treatment: These common types of headaches can be treated with techniques used by physical therapists. Outcomes: 93% of people experiencing cervicogenic headaches decreased their need for pain medications for headaches after physical therapy. Causes & Triggers: Poor posture, stress, anxiety, psychological factors, fatigue, resulting in overactive pain receptors to the brain. Causes & Triggers: Genetic and environmental factors, physical exertion, changes in the trigeminal nerve pathway, stress, alcohol. Presentation: Pain on one side of the head for up to 2 days, visual disturbances, nausea. Treatment: Medication, general exercise, good sleeping habits, regular meals, adequate water intake. Causes & Triggers: Alcohol, changes in sleeping patterns, high altitudes, vasodilating medications. 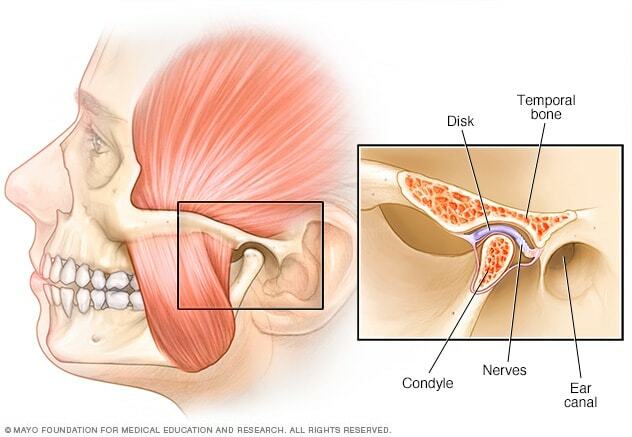 Your Temporomandibular Joint (TMJ) is where your jaw meets and articulates with the base of your skull. Causes & Triggers: This joint can become susceptible to injury (clenching jaw, excessive gum chewing) which can case pain on same side of the head that the injury is located on. Presentation: pain in the temporal region, inability to open or close jaw fully. Treatment: A physical therapist can modify your joint mechanics, provide you with specific rehabilitation exercises, and warn you of the activities that are causing the provocation of the TMJ, resulting in headaches. How can physical therapy help your headaches? During a physical therapy evaluation, a PT will examine all relevant structures (muscle, cervical joints, bone, connective tissue, nerve) that can cause headaches. Based on the results of your evaluation the physical therapist will determine if they are able to help you, and if not refer you so that you can receive appropriate care. If there are any structures that are restricted, inflamed, or injured, a physical therapist can then treat the identified source through various techniques to rehabilitate the affected tissue. Identify the type of headache that you are dealing with. Seek help! If you would like to pursue physical therapy for pain relief and would like suggestions on where to go free to contact me for recommendations in your area. Get active again! Would you like to get back to activities that your headaches prevented you from participating in? Are you ready to jump start your journey of health & wellness but would like some guidance on how to make sure you achieve results? Join my Free Facebook Community called The Daily Motion to take action today! https://rehabinmotion.files.wordpress.com/2017/03/9cace-6-different-types-of-headaches-with-cause-and-possible-treatment.jpg. Accessed February 18, 2017. Cervicogenic Headaches. A+ Physio. https://www.aplusphysio.co.nz/wp-content/uploads/2014/09/cervicogenic_headache.jpeg. Accessed February 18, 2017. Goodman CC, Boissonnault WG, Fuller KS. Pathology: Implications for the Physical Therapist. 2nd edition. Saunders. Philadelphia, PA. 2003. TMJ Disorders. Mayo Clinic. http://www.mayoclinic.org/-/media/kcms/gbs/patient-consumer/images/2013/08/26/10/32/ds00355_im00012_mcdc7_tmj_jpg.jpg. Accessed February 18, 2017. Previous What does a Physical Therapist do? Thanks for helping me learn more about headaches. I actually didn’t know that tension headaches could be caused by stress and anxiety. Not only that, but it’s pretty cool you can know what type of headache you have depending on where it is. This seems important to know especially so that you know exactly how to take care of it. Absolutely! In my Doctor of Physical Therapy curriculum we learn about how different kinds of headaches can be treated depending on their presentation and symptoms. Glad you enjoyed it.